London – this city is one of the most culturally diverse in the world, home to the most popular tourist spots in the UK and all in all its a cool, vibrant and funky city to live in. London also happens to be one of the main places for weddings in England with lots of amazing places to ‘tie the knot’ and a vast choice of wedding cars and wedding transport in general to choose from. If you are looking to hire a wedding car in London then we can help find the most suitable vehicle for you taking into account many of the factors to take into account as discussed below. London is of course a large city and its not just the centre where weddings take place, you also have to look at North, South, East & West as well as the suburbs and outskirts which fall within the boroughs of London. Central London is the hub of everything with lots of high end wedding venues but in the other areas of the city and indeed on the outskirts there are many other wonderful wedding venues, many of them much larger than the ones in the heart of the city. You may also find that the venues away from the centre are new build venues or conversions that are purpose built for for varying culture weddings some of which typically will be attended by very large numbers, for example Sikh or Hindu weddings. 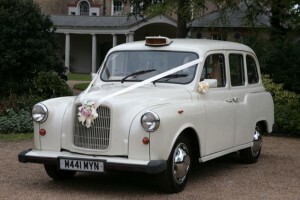 Wedding cars and wedding transport in general therefore will often be driving all around London collecting brides, grooms, bridesmaids, family, guests etc from home addresses, hotels etc, delivering them to the wedding venues and then in most cases returning the passengers back to home, hotel etc. 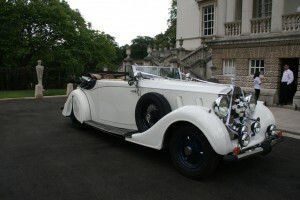 With wedding cars you can choose anything from a vintage 1930’s Rolls Royce to a new 2018 Mercedes S Class, all types of cars are available – modern, classic, vintage, American, Campervans, Buses, Coaches, Limousines – there really is a wide choice but ultimately the perfect vehicle for you will be down to personal preference, wedding theme and colour schemes, practicality, access, numbers of people / passengers, venues, travel distance and time. The choice of vintage cars is most limited due to the age of the vehicles and how many are actually kept within London itself, the further outside of London the cars are kept the more travelling they have to do to get into and around the City, generally vintage cars are most suitable for short journeys. The most popular vintage cars are of course the Rolls Royce models such as the Phantoms, Wraiths and Ghosts, there are also a range of vintage style cars such as the Beaufords, Regents and Bramwiths. If it is a classic wedding car you prefer then its more about the 1950’s & 1960’s but as time moves on some vehicles from the 1970’s and even 1980’s can fall within the classic car category. The no.1 choice of classic car is by far the Rolls Royce Silver Cloud, predominantly in White / Ivory as it just has that real classy look and feel, they are also renowned as cars that travel well and can cope with driving in traffic, particularly good in London. 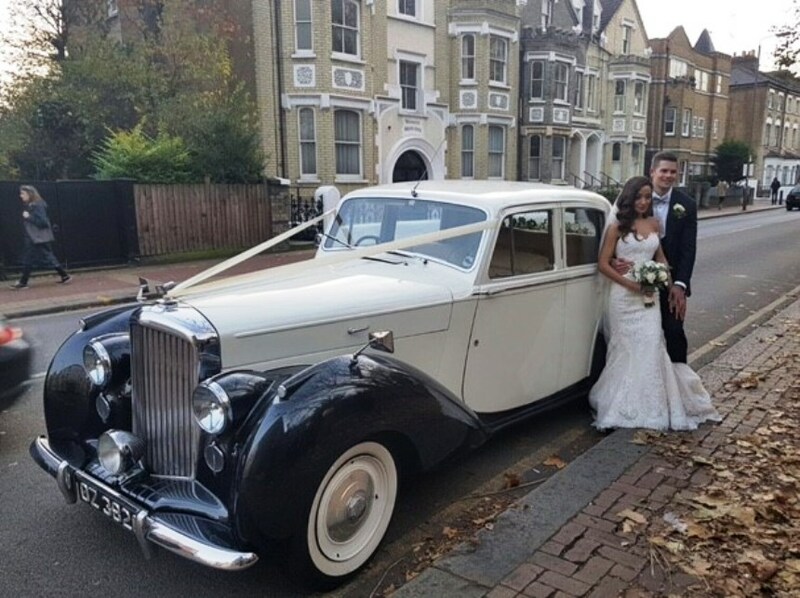 Other popular classic wedding cars include the Bentleys such as the R Type, S1, S3 and MKV1, the Daimler DS420 and V8 models, other variations of classic Rolls Royce such as the 1950s Silver Wraiths & Silver Dawns, the 1960s Phantoms, the very spacious Austin Princess and Armstrong Siddeley, Jaguar S Type and MK2. How far you will be travelling in the car is more important in vintage and classic weddings and buses as by nature the journeys can take longer. In London however this factor should be considered whatever type of wedding car you are using due to the potentially slow traffic conditions and parking. How much you wish to spend on your wedding transportation is something else to think about. Traditionally, the priority is the vehicle for bride and her father and then bride and groom and in the grand scheme of wedding costs, the hire of one wedding car should in most cases be affordable and budgeted in. A bridesmaids car is usually very high on the list also and therefore an additional car is often required for this reason. How many guests do you have? It is very commonplace now for the wedding guests to be thought about and this can result in the need either for additional wedding cars, Limousines or as is extremely popular and indeed practical, the classic and vintage buses such as the Routemasters (Classic Red London Buses). Timings: Please do not underestimate the travel time between different addresses and venues, particularly if going from one side of London to another – this possibly is something to consider when in the very early planning stages for your wedding. 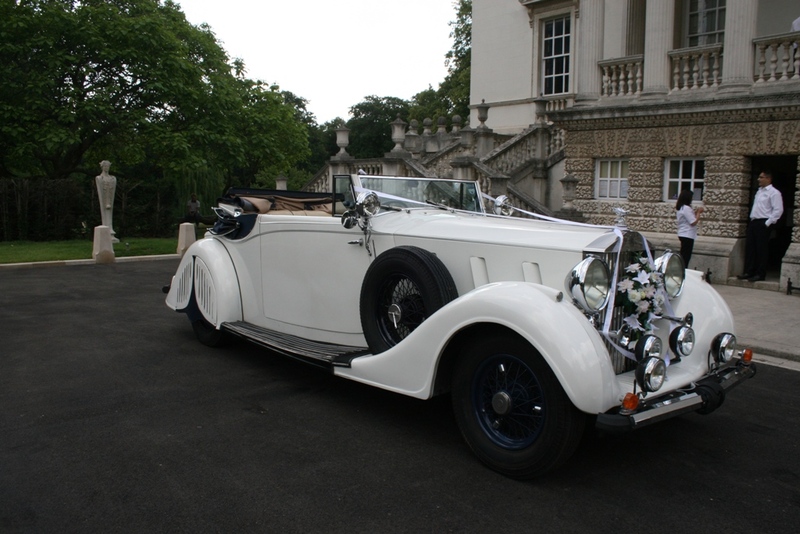 For example, if your desire is for a 1920’s vintage wedding car, it may not be very practical to want it to drive from South East London to North West London or from South West to North East, its really about thinking of the most suitable vehicle for your requirements. You may also need figure out how long you would need the car or bus for… it could be just for a single one way journey, for the vehicle to take you on to a reception venue immediately after the ceremony, onto somewhere for photos first or even for a vehicle to come back later and take you onto an evening venue. Access and parking: Aside from dead end roads and one way systems, access is really only a potential issue for buses, its not a huge problem in London as there are not so many low trees and narrow lanes to contend with but some venues may have restricted access, particularly in the heart of central London. Parking issues can often be resolved with forward planning such as contacting local council authorities and requesting reserved parking places, again this is mainly to be considered within central London, a lot of wedding venues moving away from the city will have parking facilities. Of course there are many different cultures that live and getting married in London which means that the types of weddings are very diverse and requirements are very different, this includes the type of wedding car. Sikh and Hindu weddings for example often have totally different wedding car needs compared to a C of E or registry office type wedding. These weddings are generally longer and therefore longer hire periods are normal, often 9 – 10 hrs or more often with a few journeys involved and so there does need to be careful consideration of the chosen vehicle or vehicles. 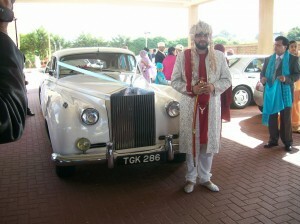 For some faiths, the correct colour of car may be important as well as the style and if, as is usually the case, there are large numbers attending then multiple vehicles attending the wedding is not unusual. All over London there are many famous, popular, exclusive and very high end wedding venues such as Syon Park, Horniman Museum, Hampton Court Palace, Kensington Palace Orangery, Kew Gardens, The Savoy, The Hilton etc etc. There are also the Gurdwara Temples, The Krishna Temple in Soho, The Shri Swaminarayan in Neasden – these are where the majority of the religious side of the wedding will happen prior to moving onto where the further celebrations will take place at large venues such as Ariana, Meridien Grand, Pavillion, Regency, Prince & Princess etc. Vintage cars are probably the number one choice followed by classic and then modern. First Choice Wedding Cars can organise vehicles from a very wide selection including Bentleys, Daimlers, Jaguars, Beaufords, Regents, Campervans and of course the classic and iconic London Taxis. Found this article interesting? share it!